Disclaimer – This post contains affiliate links, which means if you purchase something through an ad on this page I’ll receive a commission at no extra cost to you. Thank you for your support. Hello! I hope you are all well where ever you are and I’m glad you’re back! 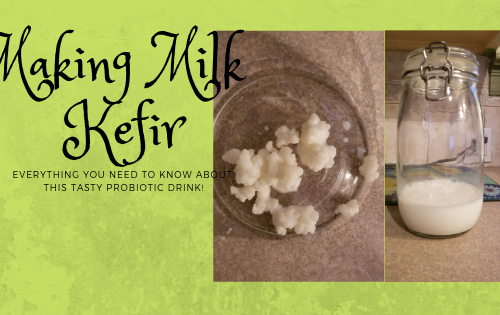 In my last post, I talked about how to make milk kefir; fermented milk with lots of healthy probiotics. Now I’m going to give you ideas on ways to use it. It’s perfectly fine to drink kefir as is but it is a bit sour and tastes like plain yogurt, which lots of people like but for many it’s not so great! Personally, my favourite is kefir smoothie! Basically, anything goes! Bananas are a great base. I pretty much use them in all my smoothies. Frozen fruit – mixed berries, cherries, mixed fruit – anything you like! Vanilla – I fine vanilla is nice if you don’t add bananas but that just might be me. 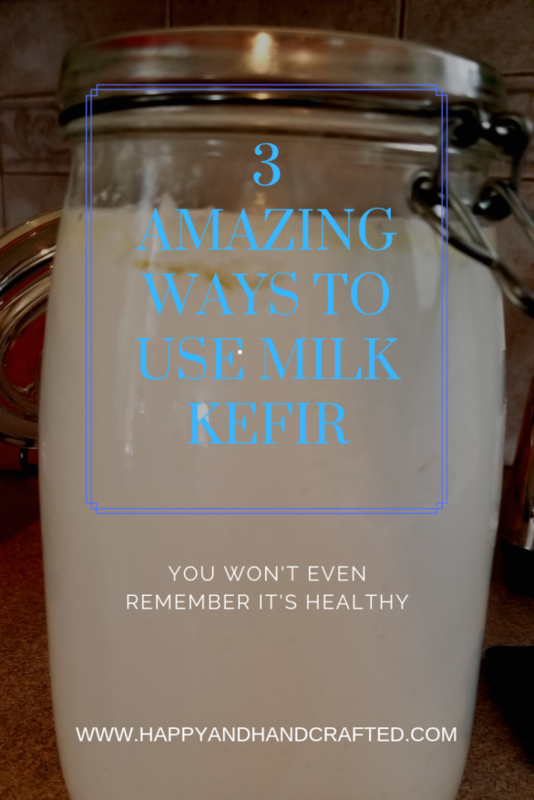 Kefir – I just pour in enough kefir to top it off. Blender – It doesn’t have to be anything too fancy but I have tried the Ninja and it’s definitely on my wishlist! I basically just fill the blender with all the fruits, veggies and seeds I want, then add the kefir and blend! yummy!! Now I have to say in my opinion this sour cream is 100% better than any store-bought version! Just try it and you’ll see! All you have to do for this is put table cream in with your Kefir grains instead of milk. Wait for 24 – 48 hours (24 is usually enough) When it’s nice and thick strain it and that’s it. Really, it’s that easy! Done and ready to use!! If you’re familiar with kefir you can see how much thicker it is than kefir made with just whole milk. To make cheese, all you have to do is make your Kefir as normal and make sure it’s good and thick before you strain it. That’s really important! The easiest way to strain it is to have 2 plastic strainers. Put one strainer over the bowl then layer with cheesecloth. Make sure you use a good quality cheesecloth. 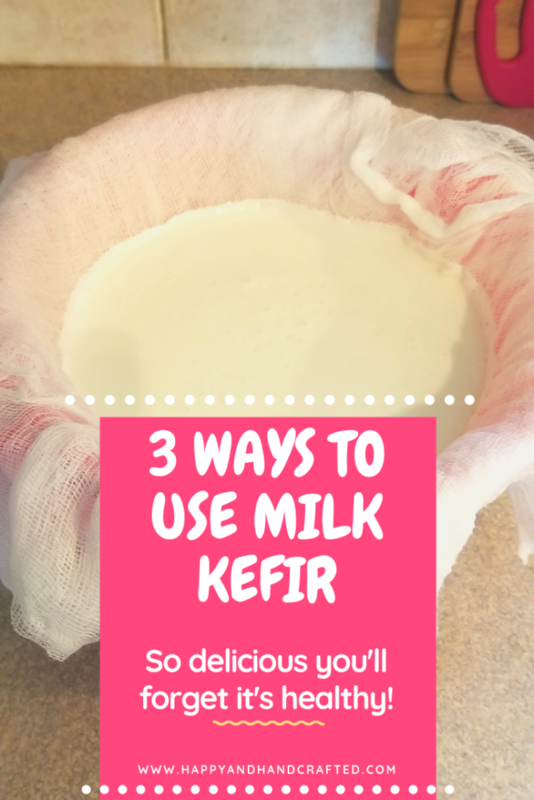 If you don’t have access to that then use a few layers so the Kefir doesn’t just strain through. Put the other strainer over that one and pour the kefir in to collect the grains. If done right there should be clear liquid (whey) dripping into the bowl. Leave it like this for an hour or so, so it has a chance to harden a bit. Once that’s done fasten the cheesecloth in a way that you can suspend it over a deep bowl and let it drip for at least 24 hours. After the 24 hours untie the cheesecloth and pick out the bits of cheese. Now you can flavour it. Anything goes really! Use your imagination! This is after 24 hours. Ready to be scraped into a bowl. Finished cheese, ready to be seasoned. It has a mild flavor so it’s a blank slate. Time to get creative! You could do some sweet ones as well, maybe strawberry or a mixed berry. That’s all there is to it! There are so many options! Recently, I tried using half whipping cream and half whole milk this made a delicious dessert topping. I had to stir the kefir a couple of times while it was fermenting because it was so thick. After I strained it I added about a tablespoon organic cane sugar, you could use any sweetener of your choice or none at all because it doesn’t taste too sour. Mix that with a couple of tablespoons of vanilla and pour it over some frozen berries (cherries are my current favourite) and that’s dessert! I also added some chia seeds because I love them but that’s completely optional! 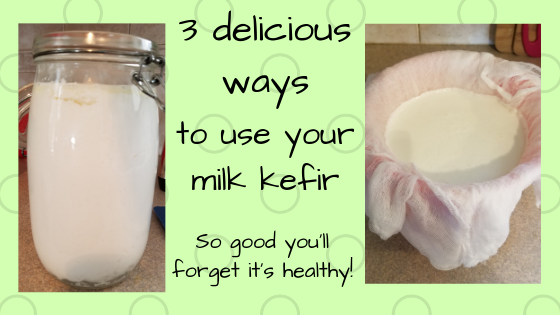 So I guess that’s 4 ways to use your kefir! Bonus! Awesome, I’m curious how the smoothie would taste. great piece though. Thank you! The smoothie is delicious! Just a matter of finding out what combos you like. This is really interesting. I never knew this was possible! Thank you! There are many options and they are all delicious! These are all great ideas! Kefir is so delicious! I don’t drink it anymore but when I did, I just liked taking a little shot of it in the mornings on an empty stomach! It is good! I love having options so it’s not the same all the time! Wow i love kefir its the only dairy I really eat! I love to use it as a cream cheese spread!! The cheese is delicious and good on almost everything! Thanks for reading! Cheese…. did you say cheese! I always thought of kefir as just a drink so thanks for including other options for use. You’re welcome! So delicious…I just made a batch today and I can’t wait to dig in!